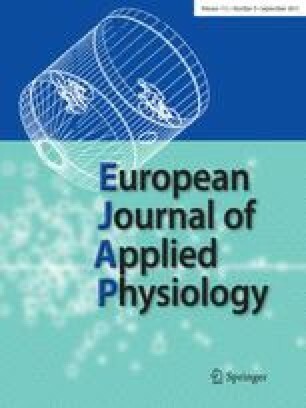 Our purposes were (1) to examine resting arterial blood pressure following an acute bout of resistance exercise and submaximal dynamic exercise, (2) to examine the effects of these exercises on the plasma concentrations of atrial natriuretic peptide ([ANP]), and (3) to evaluate the potential relationship between [ANP] and post-exercise blood pressure. Thirteen males [24.3 ± (2.4) years] performed 15 min of unilateral leg press exercise (65% of their one-repetition maximum) and, 1 week later, ≈15 min of cycle ergometry (at 65% of their maximum oxygen consumption). Intra-arterial pressure was monitored during exercise and for 1 h post-exercise. Arterial blood was drawn at rest, during exercise and at intervals up to 60 min post-exercise for analysis of haematocrit and [αANP]. No differences occurred in blood pressure between trials, but significant decrements occurred following exercise in both trials. Systolic pressure was ≈20 mmHg lower than before exercise after 10 min, and mean pressure was ≈7 mmHg lower from 30 min onwards. Only slight (non-significant) elevations in [αANP] were detected immediately following exercise, with the concentrations declining to pre-exercise values by 5 min post-exercise. We conclude that post-exercise hypotension occurs following acute bouts of either resistance or submaximal dynamic exercise and, in this investigation, that this decreased blood pressure was not directly related to the release of αANP.